Hired: I’m the new #Gov20 DC Correspondent for @OReillyMedia! I’m thrilled to announce that I have a new job! Earlier today, I accepted an offer from Tim O’Reilly to be the Washington, D.C. correspondent on Government 2.0 for O’Reilly Media. 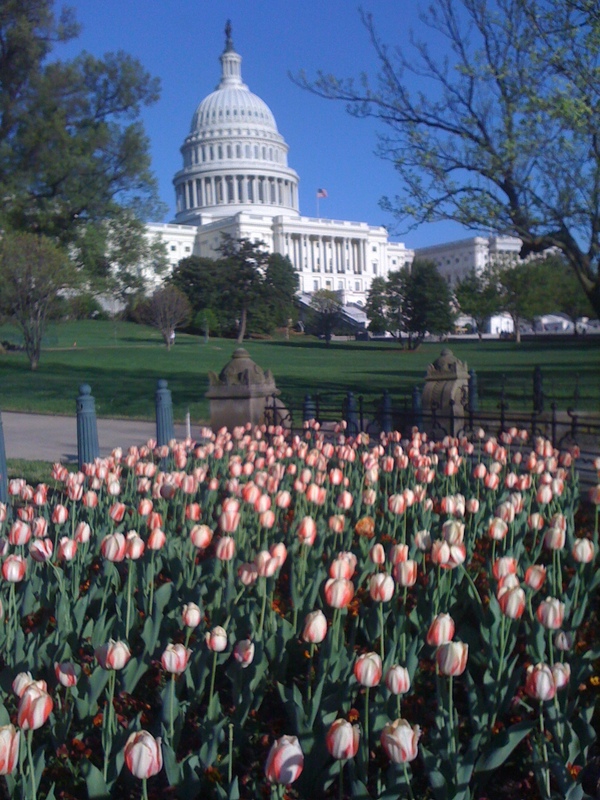 I’m hitting the ground running here in the District of Columbia, since O’Reilly’s upcoming 2010 Government 2.0 conference is only a few weeks away — and there’s plenty to do. Over the following months, I expect to write – a lot – about how technology is being used to help citizens, cities and national governments solve big problems. I also expect to frequently explain what “government 2.0” is, since the term is in my title! I’ve written before about the language of government 2.0, the history of disruptive innovation and the ways government adapts to technological change. That’s part of it. So is Tim O’Reilly’s concept of government 2.0 as a platform, naturally. And so is writing about government transparency, the Open Government Directive, relaunches of .gov websites like SupremeCourt.gov or Reboot.gov, and the people behind the technologies that are driving change and innovation. There’s no shortage of case studies to highlight, from the local town green right on up to the federal or international level. Just listen to the voices from the Gov2.0 LA unconference for a small sample of the perspectives on the issue. O’Reilly’s goal in Washington D.C. is to “create a context in which people can think” differently about the role of technology in government, and the role of government in society. I look forward to helping to create that context. In service of that goal, I’ll be blogging, conducting short interviews with government officials and industry participants, writing features and using the rest of the tools for digital curation I’ve been honing in the past several years. I’m very excited to get started. I expect my new position to be challenging, engaging, rewarding, occasionally frustrating and never dull. I also expect the process of writing about government 2.0 case studies to be a reciprocal process, as readers help me to understand more about what stories are important to them and which voices deserve to be heard. I hope that in the days and months to come that you’ll share your perspectives, ideas and suggestions with me. The story of government 2.0 is already being written every day by citizens, civic hackers, advocacy groups, government employees, researchers and technologists. As a digital pilgrim, I look forward to chronicling that progress. You can access and embed this Wordle for 3 Words from Transparency Camp 2010 at Wordle.net. Learn more about Transparency Camp at TransparencyCamp.org. There is a Transparency Camp livestream. Here’s a second Wordle for Transparency Camp 2010 that removes the transparency duplicate, since Wordle.net dupes words when they’re capitalized. 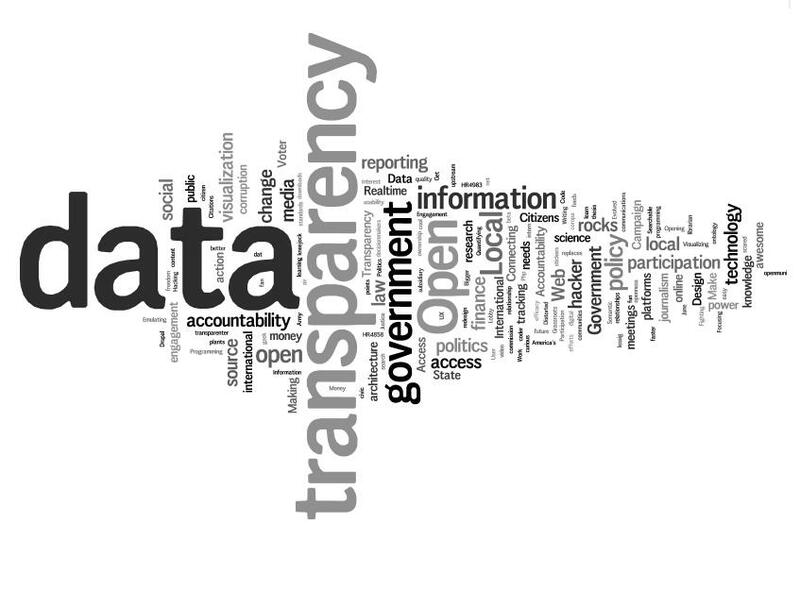 Finally, there’s a final Wordle for Transparency Camp 2010, with all capitals removed. Fittingly, I had to clean my data to get a good visualization that accurately represented the data I reported upon. There’s a new .gov on the block: after years of a decidedly dated website, the Supreme Court has a new look — and address — at SupremeCourt.gov. The Supreme Court announced the new site without a great deal of fanfare, sending a release which SCOTUSblog.com posted as a PDF. As Orin Kerr observes at the Volokh Conspiracy, the new site replaces the old supremecourtus.gov and drops “us” from the URL. Users still have to enter “www” in, however, which is less than ideal. C’est la vie. My Supreme Court preview for 2009-2010 has been a constant source of traffic to this blog, demonstrating a continued interest from the online audience in the cases before the highest court in the land. Despite the “updated and more user-friendly design,” that the release promised, some users may be frustrated. There’s a separate concern for the rest of the Web, however: as clicking on the links that post show, SupremeCourt.gov webmasters have not forwarded many old URLs to new ones. Many links simply default to the home page. I suspect a few law librarians around the world may have a headache tomorrow. It’s going to be a grimace-inducing issue for a few newspapers, too, if redirects aren’t rolled into place. The most-debated ruling of recent months, “Citizens United vs. Federal Election Commission,” in which the Justices rejected campaign spending limits? That’s now a default link to the SupremeCourt.gov home page from the New York Times SCOTUS story on it. (Google also hosts a PDF of the decision, if a searcher is clever enough to find the cached version.) “Citizens United vs. Federal Election Commission” is up at SupremeCourt.gov. It’s just a new URL. SCOTUSblog.com has the same issue with links to opinions. These broken links are going to be a huge headache for organizations of all stripes if the redirects don’t get implemented. For those who visit SupremeCourt.gov in search of recent decisions, one click will bring the searcher to a list of Supreme Court decisions from the current term, rendered in chronological order. If you want to go back further, search away – but good luck going very far back in time. A search for another famous case, “Bush v. Gore,” for instance, turns up very little on the new site. The case is just a click away elsewhere, at Supreme.Justia.com, for instance, or at Oyez.org, where audio of Bush v. Gore may be heard. Given the rich resources that exist elsewhere on the Web, it is unfortunate for information-seekers that internal search doesn’t point elsewhere. Even though legal concerns about endorsements of third-party commercial media concerns may pertain, stated website policies would appear to insulate the court against some of those concerns. It’s also worth observing that most documents on SupremeCourt.gov remain in .PDF format. On the one hand, that may allow it to be spidered by Google. On the other, PDF is definitely not a machine-readable format. Clay Johnson has made a strong case for why that PDFs are problematic for government. I’m not inclined to disagree, although I’d much rather see cases, briefs and other documents posted as PDFs than not at all. Given the continued reliance on PDFs, however, don’t expect enterprising “lawhackers” to create mashups like the ones surrounding data.gov. Given the improvements to other federal websites, in particular WhiteHouse.gov and the launch of the FCC’s Reboot.gov, I can’t help feel disappointment. The fact that there is no video or audio of cases remains a standing frustration, given the careful questioning and deliberation the justices display and the long hours of preparation counsel undergo to argue cases before the Supreme Court. Tthe Supreme Court has now assumed management of its own website, retrieving it from the Government Printing Office.” The Court received funding in its FY20 10 appropriation to make the transition from GPO to in-house management. That transition will enable the Court to integrate the Web site with the Court’s other operations, improve the quality of the site, and expand services for the public’s benefit. The Court received funding in its FY20 10 appropriation to make the transition from GPO to in-house management. That transitionwill enable the Court to integrate the Web site with the Court’s other operations, improve thequality of the site, and expand services for the public’s benefit. SupremeCourt.gov does provide access to opinions, orders, docket, Court calendars, transcripts, schedules, rules, visitors’ guides, case-handling guides, press releases and other general information. If the public is to benefit further by leveraging the Internet to gain insight into the Supreme Court’s operations, the webmasters of SupremeCourt.gov might do well to focus their efforts in the rest of the 2010 towards implementing further improved functions as well as that fresh design. If they can fix those broken links and supplement existing case pages with external resources, like the Supreme Court Database, perhaps that livestream of oral arguments can wait for a few more months. That was Anil Dash’s summary of a basicchallenges that lie ahead for many world’s representatives as they explore Twitter, Facebook, YouTube, blogs and other online platforms that allow reciprocal communication. 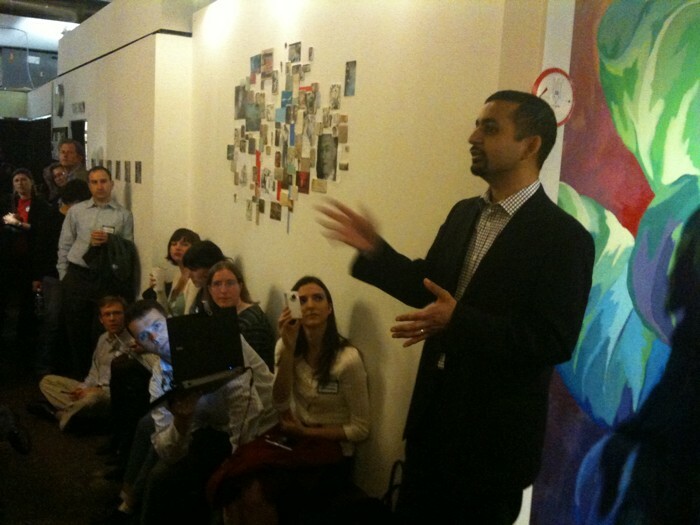 Last year, he wrote that “the most Interesting new tech startup of 2009” was government. Dash knows a thing or two about tech startups as the first employee of Six Apart LLC, one of the world’s leading blogging companies. He understands online engagement too, after blogging at Dashes.com since 1999. Now, however, he’s set his sights on an even bigger goal: transforming the ways citizens relate to their government through social media using a startup mindset. The first project at Expert Labs will be a “ThinkTank App,” an open source web application that aggregates and organizes replies to status updates on Twitter. ThinkTank App was developed by Lifehacker founder Gina Trapani, who has signed on with Expert Labs to develop the platform. The event was the fourth “Sweets and Tweets” event produced by corporate social media consultant Debbie Weil. The first client for Expert Labs is one that would make most startup founders swoon, too: the White House will be using the ThinkTank app to get better answers from citizens. As Dash wrote in describing “Expert Labs, Gina Trapani, ThinkTank App and our Grand Challenges,” he’ll be collaborating with the White House in support of the Grand Challenges initiative. “We want to create a different space for participation that rewards good answers, said Dash. He cited several online websites with communities that allow meaningful exchange of information without the ugliness that pervades many comment boards, including stackoverflow.com, ask.metafilter.com and the site his wife manages, SeriousEats.com. Given the immense economic, social and technological challenges that lie ahead for the United States and the world in this young 21st Century, that’s a vision worth keeping an eye on. Dash’s talk was livestreamed on uStream and may be viewed there. Debbie Weil has also blogged about Anil Dash and Expert Labs, along with DC cultural maven @KStreetKate‘s write-up on NBCWashington.com. @ClearedJobsNet has also posted photos from the event. Test your broadband speed? Yep, there’s an app for that. The Federal Communications Commission (FCC) built upon its growing new media prowess with the launch of iPhone and Android applications today. The FCC’s new apps will allow users to test the speed of mobile broadband service and report deadzones where mobile broadband is not available. The FCC iPhone app is a free download from iTunes or the Android marketplace. The Consumer Broadband Test and the Broadband Dead Zone Report are also available as fixed applications at Broadband.gov. According to the FCC, the Ookla, Inc. Speed Test and the Network Diagnostic Tool (NDT) running on the Measurement Lab (M-Lab) platform are used to power the app. I ran a quick test on my home cable Internet connection. My downlink isn’t quite fiber optic speed, but I found it close to existing tools. The test depends upon Java, though many users are likely to have that installed at this point. I tried out the mobile app as well, which used the GPS in my iPhone to discover my location. According to the FCC mobile broadband testing app, I’m getting 1.42 Mbps download speed from AT&T 3G here in Capitol Hill and .11 Mbps upload. Beats GPRS, if not a Clearwire 4G connection — or my wifi. The FCC states that it’s “committed to protecting the personal privacy of consumers utilizing these tools, and will not publicly release any individual personal information gathered.” It’s posted a privacy statement to that effect. 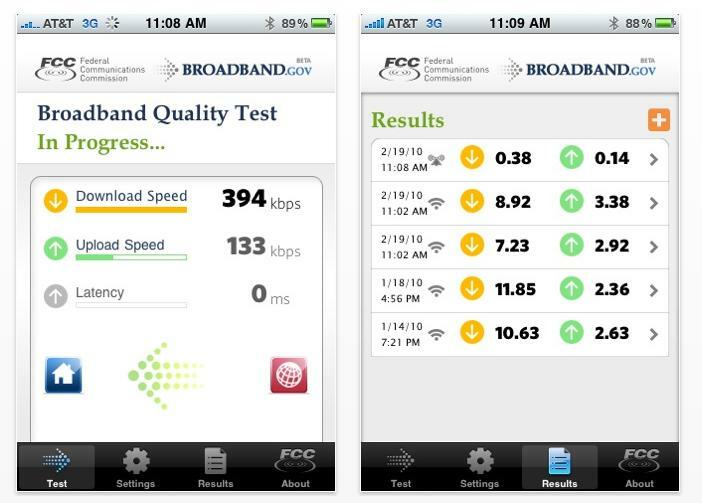 The larger context of the release of the FCC mobile broadband testing app is worth noting. The FCC will release its National Broadband Plan next week. Part of that plan will certainly incorporate assessing where broadband service is exists, how robust it is and, perhaps, how closely service matches advertised rates. This kind of data could serve in much the same vein as the FTC’s consumer complaint assistant works at FTComplaintassistant.gov. The FCC has given citizens a tool to report service quality and availability around the country. Equipped with that data, commissioners may be able to make more informed policy decisions as they roll out the broadband plan. Now it remains to be seen whether citizens use it or not. UPDATE: On Saturday night, March 13th, the FCC tweeted that over 80,000 tests had been registered using the Broadband Speed Test. 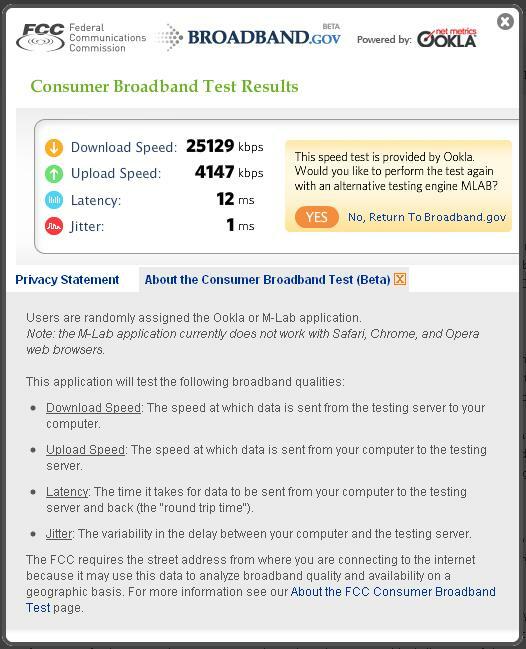 It was unclear how many tests were through Broadband.gov or the apps. Earlier this month, I stopped in Los Angeles to see what was happening at Goverment 2.0 LA, a hybrid of the unconference/camp and conference model organized by Alan W. Silberberg and Lovisa Williams. I’ve already shared some thoughts on what I learned about language of government 2.0, the history of disruptive innovation and the ways government adapts to technological change. While I’m proud of those posts, one of the themes that emerged from the weekend was the importance of video for communication. I’m not at all on “video as the new text,” especially for countries with low Internet penetration or bandwidth, but there’s no denying that online video has extraordinary power in conveying messages. Just look at video of Iranian protesters on the streets of Tehran, reports from the earthquake in Haiti or the President of the United States on YouTube. Tune in to CitizenTube any minute of the day to witness that power in action. Following are short videos from Gov2.0 LA organizers and attendees that share their takeways from the event. @lovisatalk talks about the goals of the Gov2.0 LA Camp. 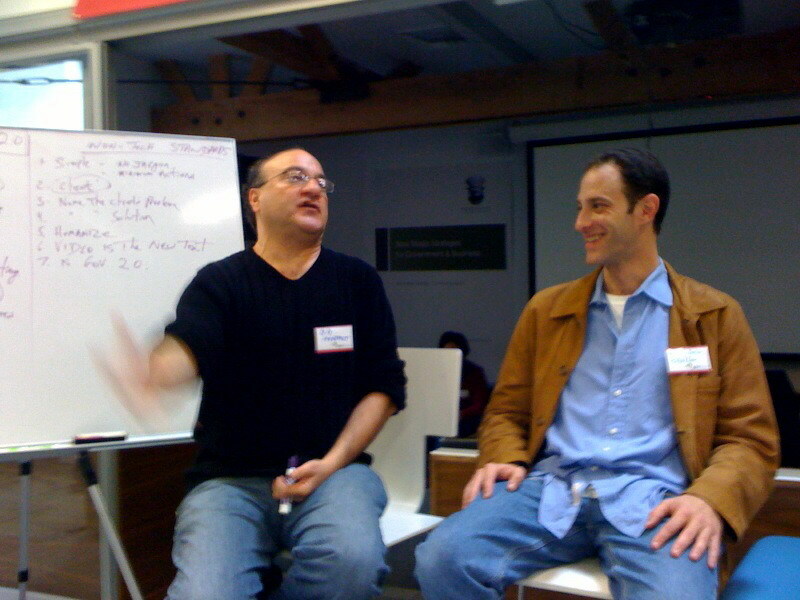 @BenBerkowitz is the CEO of SeeClickFix. @LewisShepherd discusses collaborative technology and government. @wmburke talks about Govluv.org, on online platform for connecting to government representatives using Twitter. @AntonioOftelie conducted a Government 2.0 Survey for Harvard’s Kennedy School. @AlanWebber talks about the international flavor of the Gov2.0 LA Camp. @LaurelRuma on her impressions from Day 1. @LisaBorodkin on the language of Government 2.0. Christina @Gagnier on communicating about Government 2.0. @AdrielHampton on his impressions from Day 1. Does the public need to know what Government 2.0 is? One might ask Tim O’Reilly, who has written eloquently about the topic and emceed the Gov2.0 Summit last year. One might also ask Mark Drapeau, who asked the question above earlier tonight on his blog, or Laurel Ruma, his co-chair at the Gov2.0 Expo last year, which showcased software and online platforms that used government data in innovative ways. Well and good. The line I find most compelling in the above explanation for the term is the “attempt to provide more effective processes for government service delivery to individuals and businesses.” If I had to explain the idea to my technophobic friends, that’s the tack I’d take. O’Reilly defined government 2.0 as a platform, which I also find to be a useful metaphor, if one that demands the explanation that O’Reilly himself provided at TechCrunch. 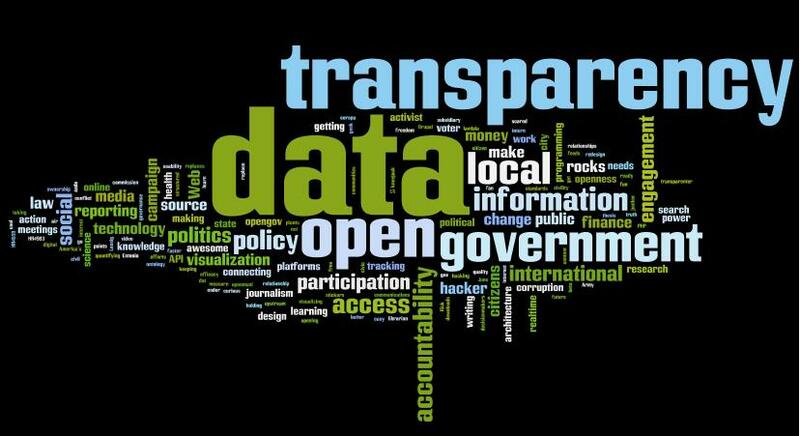 For those more technically inclined, it might be useful to talk about open data, mashups, Data.gov, the Open Government directive, XML, XBRL, virtualization, cloud computing, social media and a host of other terms that have meaning in context but without prior knowledge do little to inform the public about what, precisely, the “2.0” means. Most people have some sense of what “government” is, though there’s no shortage of opinion about how it should be constituted, run, regulated, managed or funded. Those discussions go back to the earliest days of humanity, well before organizing principles or rules emerged from Hammurabi or were enshrined on the Magna Carta or constitutions. In all of that time, the body politic and its regulatory and enforcement arms have been equipped with increasingly sophisticated tools. In 2010, agencies and public servants have unprecedented abilities because of the rapid growth of online tools to both engage and inform both their constituencies, relevant markets and others within government. The question that confronts both citizens and public servants around the globe is how to turn all of that innovation to useful change. Savvy political campaigns have already found ways to leverage the Internet as a platform for both organizing and fundraising. Few observers failed to see the way that the Obama campaign leveraged email, text messaging, online donations and social networking in 2008. One area that will be of intense interest to political observers in 2010 will be whether that same online savvy can be harnessed in the Congressional mid-terms. Micah Sifry wrote about an “Obama Disconnect” at length; I leave it to him to explore that question. What I find compelling is whether any of these technologies can be turned to making better policy or delivering improved services. In theory, good data can be aggregated to create information, which can then in turn be used to form knowledge. 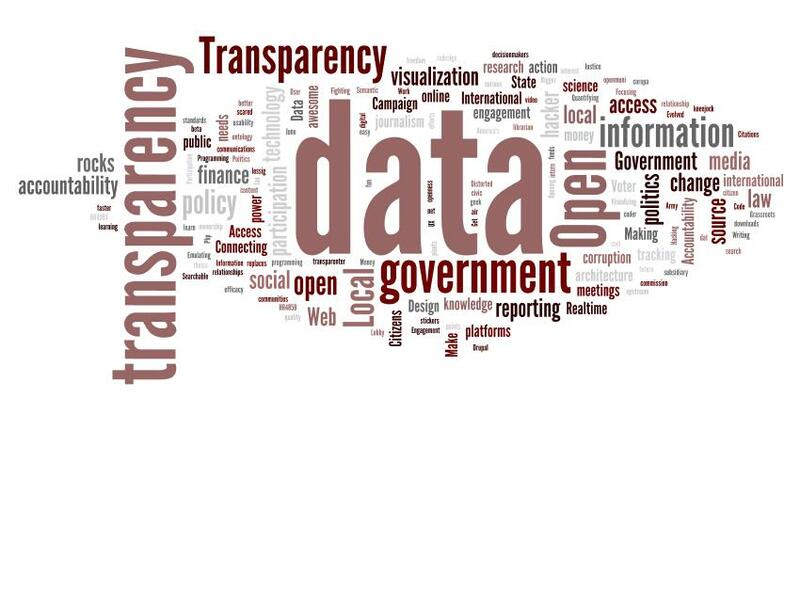 Whether the Open Government Directive dashboard at White House.gov reveals information or simply adherence to defined policy is on open question. Does the public need to know what Government 2.0 is, exactly? One might wonder if the public needed to know about what “Web 2.0” was? 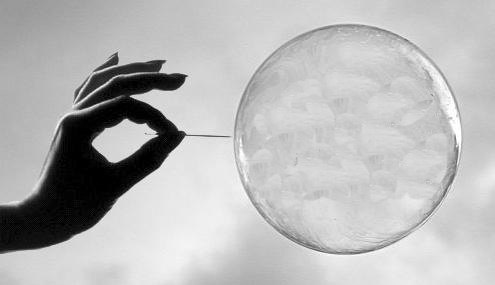 Judging by search traffic and years of Web 2.0 Conferences, my perception has been that there’s interest, if only to know what the next version of the World Wide Web might be, exactly. After all, the Web that Tim Berners-Lee’s fecund mind brought into being has been one of the most extraordinary innovations in humanity’s short history: what could be better? The short answer has often reflected the definition of Government 2.0 above: a combination of technologies that allows people to more easily publish information online, often with a social software or computing component that enables community between their online identities. In 2010, the dominant platforms that represent Web 2.0 are well known: YouTube, Facebook, Twitter, MySpace, Flickr, Delicious, Digg, Ning, StumbleUpon and a host of new mobile communities or platforms. In each case, the company is often defined by what it allows users to do: upload pictures or video, stay connected to friends, track and discover news, save bookmarks or create communities that do all of those things. When it comes to government 2.0, I believe that’s precisely how any service be defined: by its utility to helping citizens or agencies solve problems, either for individuals or the commons. The 2.0 term provides an umbrellas term for the movement and the technologies. As a thought experiment, I asked five people in the lobby where I write if they knew what “government 2.0” was. I asked the same question of “Web 2.0.” In every circumstance, no one could explain the term. And, in every circumstance, people knew what Facebook, Twitter or YouTube was, including the use of those technologies by government officials. That’s one reason why Bill Grundfest’s talk at a “Government 2.0 Camp in Los Angeles was a useful balance this past weekend, not least because as the creator of “Mad About You” he’s part of the cultural and business fabric of Hollywood. 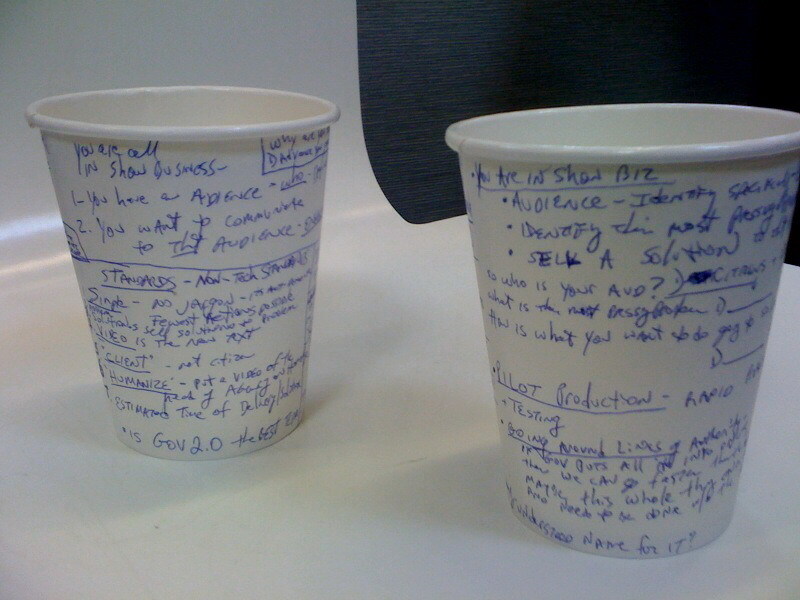 Grundfest sat through the morning’s sessions and took copious notes in a way that was novel, at least to this author, capturing the themes, memes and jargon shared in the talks on coffee cups. As she captured there, the focus of Grundfest’s frequently entertaining talk was grounded in the entertainment business: communicate clearly, humanize what’s being offered and move away from jargon. That message was delivered, by and large, to a room that knew and used the jargon. For that audience, getting advice from a true outsider held utility in both its clarity and lack of pretension. Grundfest may not have developed or managed government programs to deliver services but he has certainly learned how to tell stories. Storytelling, as journalists and teachers know well, is one of the most powerful ways to share information. It’s an art form and human experience that goes back to our earliest days, as hunters and gatherers huddled around fires to share knowledge about the world, passing on the wisdom of generations. The activity is scarcely limited to our species, as anyone who’s watched a honey bee shimmy and shake to pass on the details of a pollen gathering trip knows, but humanity’s language skills do tend to advance our ability to convey knowledge, along with the technologies we have at our disposal. Grundfest recommended the use of video, testimonials and other narrative forms to provide an entrance point into the what, how, where and, especially, why of new government technologies or platforms for engagement. Couched in humor, his audience responded with interest to the simplicity of the message. Embedded below is a video on the Gov2.o LA unconference from Govfresh that reflects that recommendation. (For others, visit YouTube.com/digiphile) By and large, I believe Grundfest’s message was delivered to a crowd of “goverati” for whom the message was valuable. Instead of dwelling any further on what Government 2.0 might be or couching discussion or branding in jargon, explain what the technology or platform will do — and what problem it will solve. And at the end of the day, remember that on language, usage drives meaning.